Another temple was completed during Wilford Woodruff’s years as the prophet. The Manti Temple was dedicated in 1888 and brought even more of the Saints the blessings that can only be obtained in a temple of the Lord. However, the completion of the Salt Lake Temple on April 6, 1893, was perhaps the most significant accomplishment for the Saints in Utah. Construction had begun on the Salt Lake Temple almost immediately after their arrival in the valley, but several factors—not the least of which was the building’s sheer size—resulted in the building not being finished for forty years. The joy with which this event was celebrated can hardly be exaggerated. The Salt Lake Temple continues to be a symbol of the LDS faith and of the sacrifices of the Mormon pioneers who sacrificed so much and who endured so much persecution, all for the sake of the kingdom. Sadly, much of the rest of Wilford Woodruff’s time as prophet dealt with the persecution of the Saints regarding polygamy. The Saints knew the commandment to live polygamy came from the Lord, and, though they are a law-abiding people, if ever a conflict arises between government and the Lord’s commandments, they must choose the latter. Thus, even after polygamy was made illegal, many of the Saints continued to live it. Though select individuals broke off from The Church of Jesus Christ of Latter-day Saints because they believed God had not withdrawn the commandment to practice polygamy, the Church’s doctrines have never changed since the Manifesto in 1890. When it was known abroad that the Church would cease to practice plural marriage, the persecution began to ease. On December 19, 1891, the leaders of the Church petitioned the government for amnesty, which was eventually granted to all those who had entered into plural marriages before November 1, 1890. This amnesty allowed those who were imprisoned for this offense to return to their families. It also removed the restrictions which had been placed against voters in the territory. It was another three years, however, until the property which the government had confiscated from the Church was returned. Because the public’s intense opposition to polygamy was the chief source of the Saints’ persecution, once the Lord commanded them to cease practicing it, much of the persecution died away. It took some time, but the Church regained its footholds and was able to focus again on the building up of the kingdom of God. Nice article. Never knew that about the prohet John Taylor. Pretty sad what the early saints suffered due to ignorance. 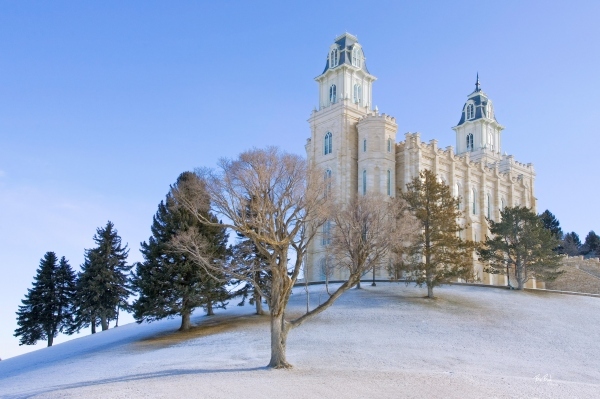 I love the picture of the Manti Temple. Is it possible to get the name of the photographer? I’m checking on the source of the image. It’s not listed in the image edit box. Thanks for your comment. where you able to track down who the photographer was of the Manti Temple?